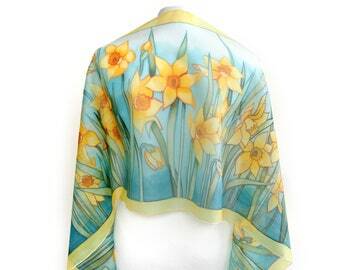 Hand painted silk scarfs and scarves! Accepting custom orders: let me know what would you like me to paint for you? Free world - wide shipping! 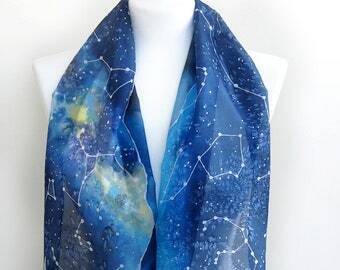 This scarf is absolutely lovely and exactly as promised. 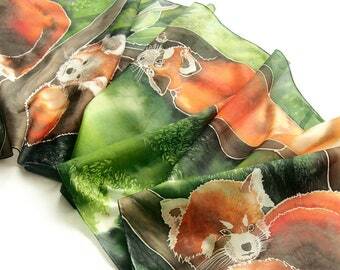 I adored one of the designs for a scarf but was looking for a larger size, and Luiza kindly custom-painted one for me. It is exactly what I was looking for. 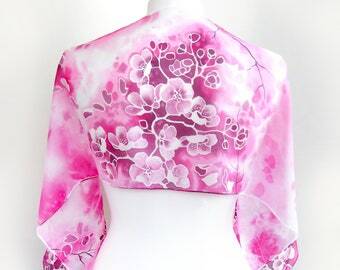 Lovely quality fabric, beautiful colours, and was shipped very quickly after ordering. Thank you! 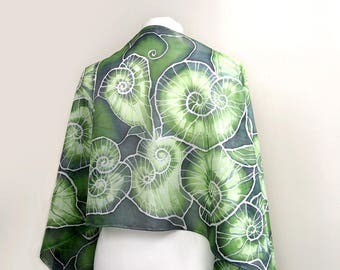 Once again, Luiza has created another beautiful, beautiful scarf. Her design is beautiful and the colors are absolutely stunning in person. 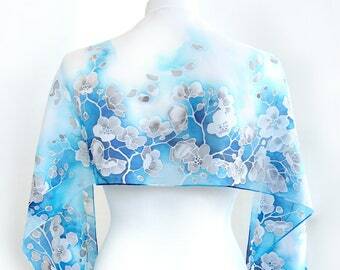 This photo doesn't to it justice.This silk is amazing, I can't stop touching it! Luiza is an absolute joy to work with! Thank you! Ready to be shipped with world wide free shipping. 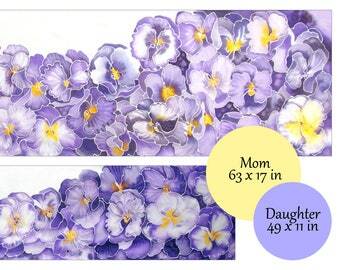 Think: Mother's Day! 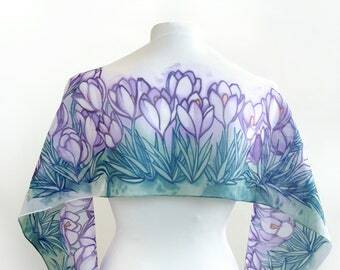 Painting the Pansy scarf, ready to be shipped with free world wide shipping! 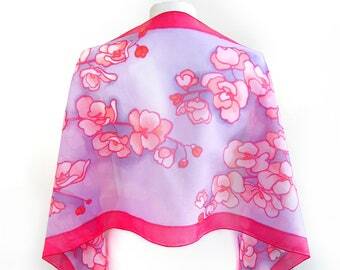 Lots and lots of silk scarfs! 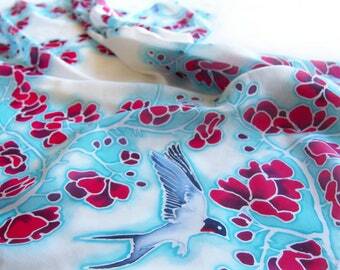 Painting the Peonia scarf on a cloudy day. 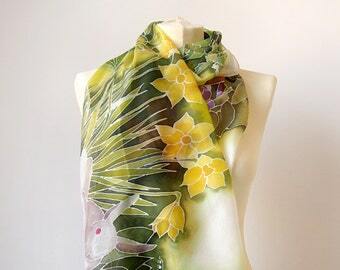 Sending White Tree in Green silk scarf. Colors for Sunset silks scarf - joy! 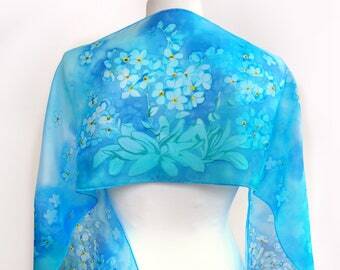 Collection of blue silk scarfs - all hand painted by Luiza Malinowska! My studio for silk painting is located in windy, magical Cracow, Poland. In my city the dragon sleeps under the royal castle and the monks still make honey and grow herbs. As a painter I'm always in pursuit of beauty and as a landscape architect I'm always finding it in my surroundings and nature. 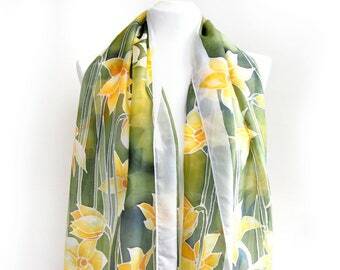 I hand paint scarves and scarfs made of natural silk (Italian or Chinese) as a wearable pieces of art: paintings of flowers, landscapes or symbolic in nature. 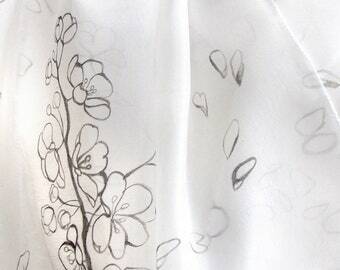 You can see that every scarf is singed with a monogram (LM) and every one is special and unique. 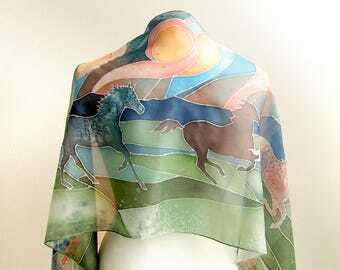 I'm a silk painter who finds her inspirations in nature. 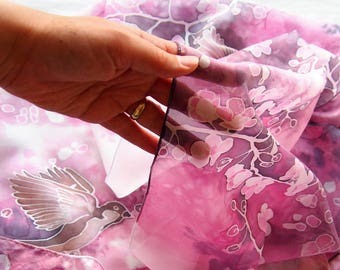 Painting silk is my passion! To fulfil your order, you must provide me with certain information (which you authorized Etsy to provide to me), such as your name, email address, postal address, payment information, and the details of the product that you’re ordering. You may also choose to provide me with additional personal information (for a custom order ), if you contact me directly. Please drop me a line! I'd love working with you on a new scarf. Knowing what you are looking for I will prepare a few sketches for you to choose from with a price estimation. 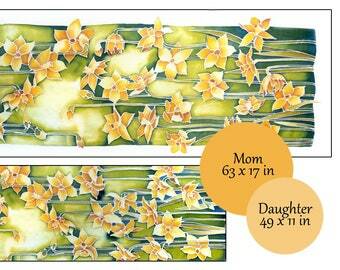 Once we agree on a design I'll paint it for you as a custom order. 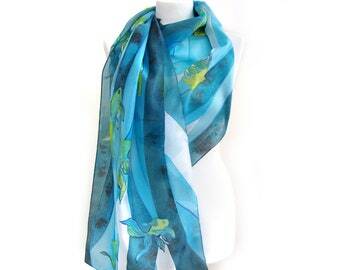 You can wash the scarf by hand in lukewarm water with a drop of natural soap. Rinse toughly with clean water. You can iron the scarf on the lowest temperature set. All carrying and washing details will be attached to the scarf in a form of a note. 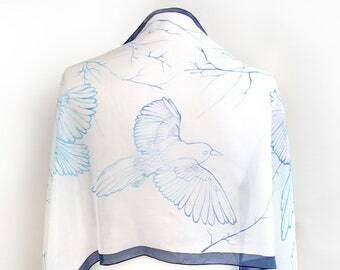 Each scarf includes note with the name of the scarf, my name and signature and the date of painting. Each scarf includes a note about carrying and washing. Each scarf is packed separatelly in a neat plastic bag, so it won't be damage during transport. It is ready for the gift - wrapping. If you need a gift - wrap or a note with best wishes, just let me know during the check out! I will gladly wrap the scarf in a special packing paper that won't get damage in shipping. US, Canada and Australia: for faster delivery and shipping trackable at every step of the way please select Upgrade Shipping to Global Express (additional 4.5USD for first item). Europe: I recommend Standard Shipping option. This is a Priority Registered Mail, which - for Europe delivery - works as good as Global Express.